I think Wednesday is now “French music day”. Any complaints? No? Good. Today’s offering is by the French electronic band M83. “Midnight City” is probably one of my favorite songs on the radio right now. It’s off M83’s latest album, Hurry Up, We’re Dreaming, which is nominated for a Grammy this year in “Best Alternative Album”. I’d give it a listen, it’s good stuff. Right now is a very special and important time of year in France: soldes. The shops here only have sales twice a year, now and in July. Since everything is normally so expensive, this is when everyone goes freaking crazy to get a good deal. Prices are slashed anywhere from 20% to 80% off, depending on where you are and how far into the sales you get. The longer you wait, the better deals, but there’s no guarantee that those shoes you’ve been eying will be there in another day. It’s a lot of fun wandering around and looking at things, but I’ve been pretty good so far. I haven’t bought anything yet, but this weekend is the last of the sales and I plan on heading to the big mall at La Defense and getting a pair of boots and some nice pants. Hopefully, I can get away with some decent bargains with three weeks of saved pay. It’s not like I need to eat anything more than bread, right? That’s what I thought so. This song was on the radio yesterday to the utter delight of S. The two of us danced around the kitchen delightedly and she knew every word. Turns out, it’s from a kid’s movie called “A Monster of Paris” about a mutated flea and the Great Flood of 1910. (It makes sense in context.) It’s a surprisingly cute movie. The singer is Vanessa Paradis, Johnny Depp’s ex. The tune’s catchy enough to make it enjoyable listen in between questioning how a giant flea learned how to play the guitar. It has been snowing off and on for the past four days. It sounds way more impressive than it actually is – we only have about four or five inches of snow on the ground. That’s still more than in Paris proper. I think there’s some sort of dark weather magic going on, where Sevres has a slightly different micro-climate despite only being 15km away from the city center. We must be on the wrong side of the river or something. 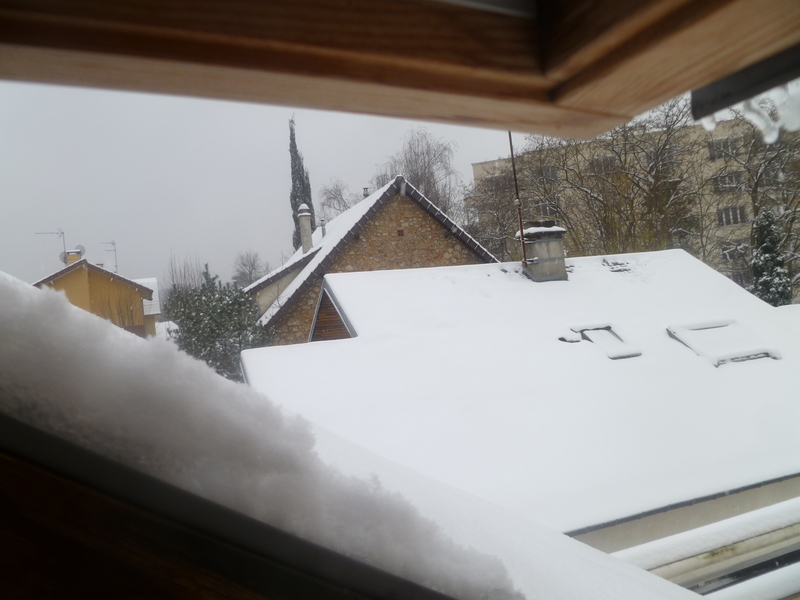 The view from my skylight. It doesn’t even have the decency to be good snowman snow. 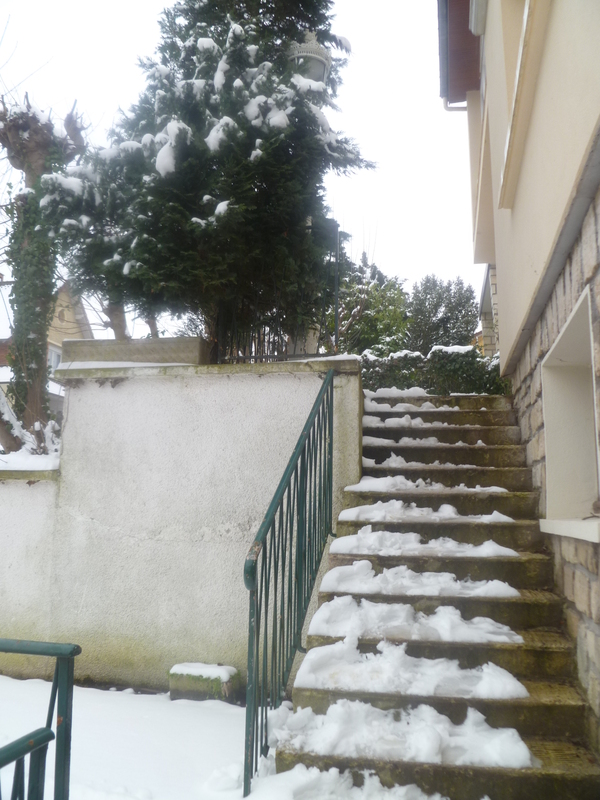 I had the lovely task of clearing off the outside stairs and sidewalk this afternoon, since they were kind of an icy deathtrap and I’d like to avoid breaking any bones. Call it enlightened self-interest. Still, it’s very pretty out. It’d be nicer if my boots didn’t leak, but you can’t have everything. There’s a great piece up over at Ta-Nehisi’s place about his thoughts on international travel. I’ve been enjoying his posts on learning another language over the past year or so, so I’m stoked that he’s actually going to Europe. (Euro Horde meetup, y/y?) International travel is a weird thing: in most cases you end up going to a place where you don’t understand the local language. There’s a particular terror and frustration reserved for these communication breakdowns. I was sixteen when I went to Taiwan for a year as an exchange student. I had about five months of intermittent Chinese lessons. I had been there previously with my family, but going on a week long business trip with your dad and going to high school where you are one of two white kids in a school of a thousand girls are two completely different things. I’ve come a long way since then, but I still remember the sheer panic and embarrassment that came with standing in front of the whole school and having to give a short hello speech in Chinese. I’m practically an expat at this point. Last year was a banner year for passport stamps (most of which can be blamed on Hong Kong’s egregious overstamping whenever you pass through border control) and I went to half a dozen countries in 2012. Incomprehension is the default and the only way to deal is to move forward. My advice to TNC? Take a couple deep breaths, smile, and bluster on through. You’ll be fine, dude. 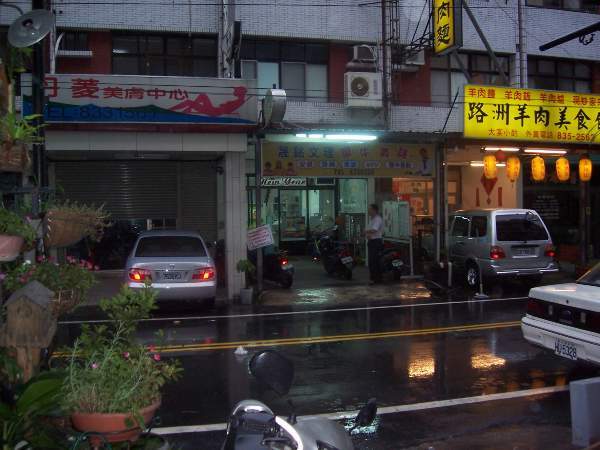 The view from my window in Hualien, Taiwan 2006.